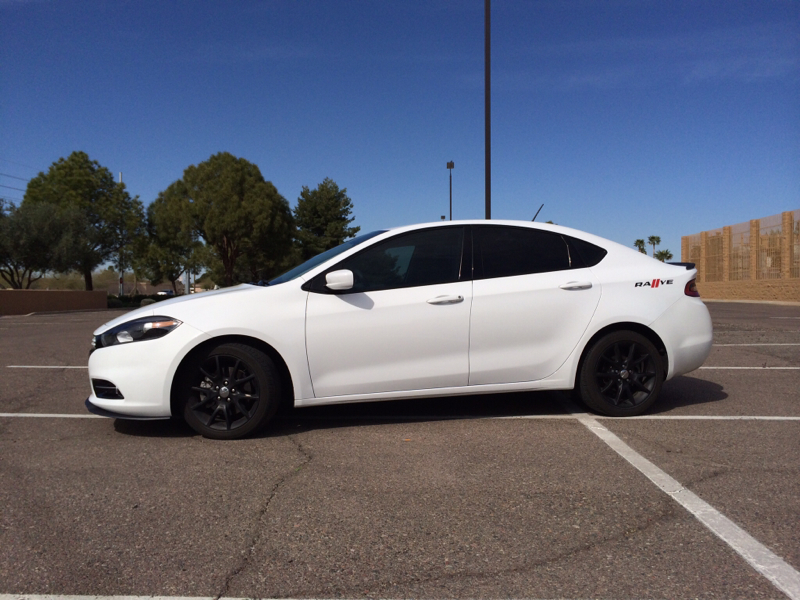 Hello, my name is Matt and I am hooked on my 1.4L turbo Dodge Dart Rallye. I get great fuel economy and a fun ride in a amazing looking car. Everyday it seems like FCA created a wonderful gem of a car. I don't care about "expensive" oil, gas, coolant, or spark plugs because I know that the 1.4 Dart is more special than just an economy-compact car; it's far more special and we know it everyday we are behind the wheel, and more so on days we don't drive it. This is a safe place for all 1.4 owners to appreciate their Darts. Please join me with your positive thoughts. Webtiger, Pretty Boy Floyd, Radam3 and 4 others like this. Love mine...........the perfect car for me!! When I bought mine I was looking at a ford focus st. I had already decided on the focus and had the dealer finding one. When I left the ford dealer there was a brand new ralleye sitting in the dodge lot across the street. I stopped to look at then test drove then bought it on the spot. The focus st was not even on the same page. Yes it was a lot faster... A lot faster. It was awfull to drive it had no soul, it felt cheap. And the ride was absolutely unbearable. I love my dart and would never trade it for anything. Thank you both for sharing and the positive thoughts. It's crazy that these cars are cost mostly under 20K (in the US). Am I right? Last edited by MoRALLYE; 05-02-2014 at 09:46 PM. Had car one week now and have gotten more comments about it than when we had our 01 Camaro SS, everyone loves it including my wife and I !!!! Truly gorgeous! It's unlike any "economy" car interior I have ever sat in. Seriously, who else makes a car like this for 20K, or less? Especially in 2012, when it was released, and 2013, it's model year. No wonder it was awarded Motorweek's drivers choice for compact sedan. I would rather drive my Dodge Dart 1.4T than any Korean car ever made. Using autostick, the power is more than adequate and the excellent handling and classy interior make it far and away the class leader. But what makes me happiest of all is that I was smart enough to buy a Dart. dad's dart, JüstCantFocüs and plumberwhit like this. nobody. looks like the prices are going up for th base model (bad move chrysler, the sales problems are because the customer isn't aware the car is so good, fire the marketing people, don't raise the price) but i seem to remember the base price being 14,995 at one point. anyway at 16.5k you get a car with 4 wheel disks brakes, roll mitigation, brake force equalization, traction/stability control, braking differential, 10 air bags, truely independant rear suspension, and 160hp... looking at other 16-17k cars only the cruze has 10 air bags, the cruze jetta corolla and focus have drum brakes in the rear. the jetta and focus have 4 speakers stereos not 6. many of these cars including the civic have torsion beam suspension in the rear. and only the focus has 160hp on the base engine. so entry to entry car the dart is hands down a winner. things get fuzzier on the top trim levels because some of the competition has a lot more power. but no one has the uconnect which might not be as oooh and ahh as certain others but it's so intuitive because they didn't build fake intuitiveness into it. things are readable and don't need artsy icons. you point at things and they work. i'm not a big fan of the garmin navigation interface but i'm not sure there is any competition that's better. i love the 1.4 even if it's just for the novelty that it's an italian engine. it's the fastest option to 60mph for the dart but i'll be honest if the 2.0 had dual exhaust in 2013 i might have been tempted to buy an sxt with a 2.0 and no uconnect to save a few grand. but in the end i think i'd still have made the same choice for the 1.4.. i mean i have a mostly great infotainment interface(though i'm not sure there is a such thing as a truely great system right now), dual range climate, leather, heated seats and wheel, ELBOW ROOM which is a big deal for a guy at 5'9.5" and 230+lbs. i have some really wide shoulders and my arms don't sit closely at my sides because i'm barrel chested. i'm not nearly as comfortable in other small cars but i do wish i went without the sunroof for the extra inch of headroom. there are many small things that you can't get in the competition, so as long as you aren't looking to compete with a mazda speed 3 or ford focus ST the dart is a really hard car to beat at any price. Any aftermarket support for 1.4L turbo? My wife is taking my car to work today support group.